Leah Dizon is back with a new single, “Love Paradox” on March 26th under the Victor label. This will be her 4th single and just over seven months since her last single release, “L·O·V·E U”. Leah recently released her debut album last year in September with “Destiny Line“, which peaked at #9 on the Oricon Album Ranking. The CD-only edition will include a bonus track. 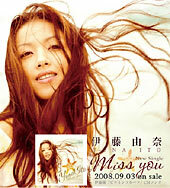 BoA’s 26th Japanese single, “be with you.”. Utada Hikaru’s 20th and double A-side single, “HEART STATION / Stay Gold”. BENNIE K’s 13th single, “Monochrome” under the For Life Music label. the brilliant green’s 1st best-of album, “the brilliant green Complete Single Collection ’97-’08”. JAMOSA’s 2nd full-length album, “CRY”. Hello Project unit Buono! is set to release their debut album, “Café Buono!” on the 20th of February under the PONY CANYON label. The album include their singles, “Renai♥Rider” and “Honto no Jibun” plus 10 more tracks. Album: Buono! – Café Buono!